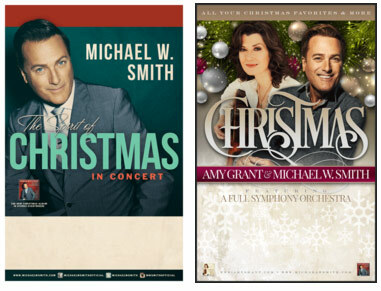 Nashville, Tenn. (Sept. 8, 2015) - Selling more than 15 million albums, Michael W. Smith will once again bring holiday cheer to arenas, coliseums and theaters to more than a dozen markets this holiday season through his nationwide Christmas tour. Smith's long-time friend and fellow GRAMMY® winner Amy Grant will co-bill with him in select cities including Houston, Dallas, Minneapolis, Sioux Falls, St. Louis, Atlanta, Greensboro and Fairfax. The evening will feature favorites from Smith's latest Christmas release Michael W. Smith & Friends: The Spirit of Christmas, which includes an all-star lineup of guests - Vince Gill, Lady Antebellum, Little Big Town, Martina McBride, Amy Grant, Carrie Underwood, Jennifer Nettles, Bono and Michael McDonald. The holiday album scored a nomination for "Christmas Album of the Year" at the upcoming 46th Annual Dove Awards. Smith also earned a nod with "Christ Be All Around Me" for "Inspirational Song of the Year." For a full list of tour dates and ticket information, visit michaelwsmith.com/tour. Michael W. Smith is an acclaimed singer, songwriter and musician who has sold more than 15 million albums, achieved 32 No. 1 songs, earned three GRAMMY® Awards, one American Music Award and more than 40 Dove Awards. In honor of ASCAP's 100th Anniversary, Smith, along with Amy Grant, was honored as "a cornerstone of Christian music," for his groundbreaking career and significant influence on the genre. In 2014, Smith released both Hymns, his first-ever classic album featuring church favorites available exclusively at all Cracker Barrel Old Country Store® locations and CrackerBarrel.com, and Sovereign, which took a Top 10 spot on the Billboard 200, as well as the No. 1 spot on Billboard's Christian Albums Chart. His fourth career Christmas album, Michael W. Smith & Friends: The Spirit of Christmas, released during the fall of 2014 and received critical acclaim from The New York Times, USA Today and more. Featuring Vince Gill, Lady Antebellum, Little Big Town, Martina McBride, Amy Grant, Carrie Underwood, Jennifer Nettles, Bono and Michael McDonald, the project was one of the top-selling Christmas albums of the season. Smith is an active supporter of Rocketown, the Nashville-based center for at-risk teens, Compassion International and Samaritan's Purse, the ministry headed by Franklin Graham. For more information, visit www.michaelwsmith.com.